Now that I have mastered the art of the No-Soak Bean, I decided it was time to re-tackle baked beans. I say re-tackle because I have been working on them on and off for the past five years. While I have enjoyed many of my attempts, none have been particularly noteworthy. The main problem has been the consistency of the beans themselves. One of the problems I had with my previous method of presoaking and then cooking the beans is that the skins tend to split and crack and the beans are mushy, so it is nearly impossible to get the sauce rich and thick without destroying the beans completely. 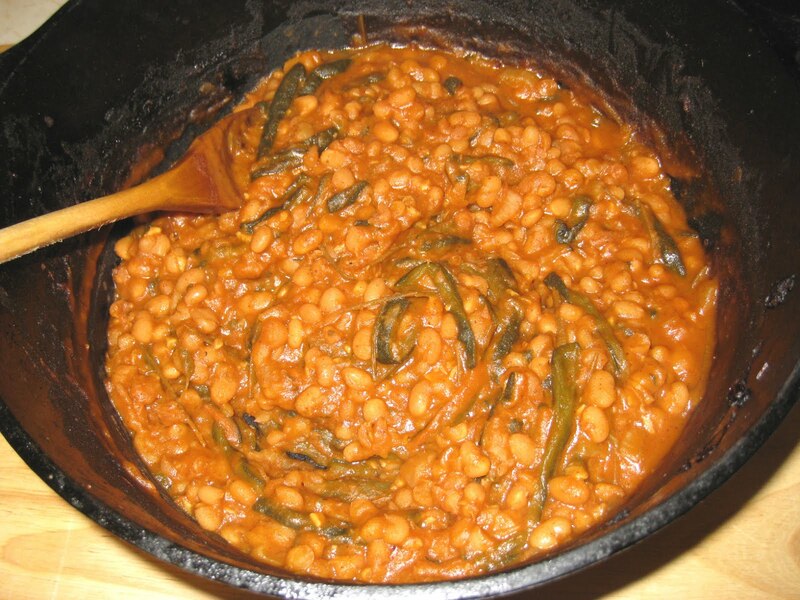 With the no-soak method, the skins stay intact and the beans, while cooked all the way through and tender, are not mushy. The best way that I can describe it is that it is like the difference between boiling and roasting. With all of that presoaking, the beans absorb a lot of water and I think that is what makes the skins shred and the beans more mushy. When the beans are cooked in the oven without the presoak, the interior of the bean is more dense and the flavor is more concentrated. I will never soak another bean again. Especially if I am going to bake them. I finally hit the jackpot with my latest attempt. It may partly be because I have been playing with the technique these past few years, but I am convinced it is mainly because the beans hold their structure so much better that they can stand up to a long, slow baking time. 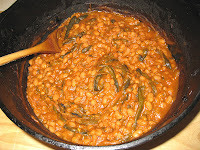 This batch was thick and rich with the concentrated flavors of the sauce and the beans. Edgewater Produce had the biggest, most beautiful fresh poblano peppers I have ever seen for $0.69 per pound. Whole Foods' less robust peppers weren't even contenders at $2.49 per pound. They are a mild pepper, used mostly for chili rellenos. That was originally why I bought them, but then I realized I would have to fry them and I didn't feel up to that particular task. 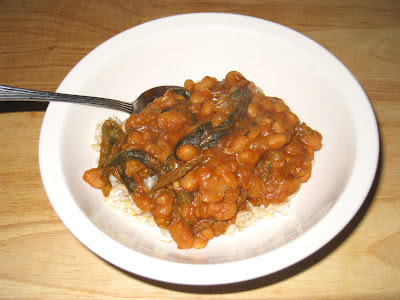 I knew their smoky flavor would be the perfect complement for the beans, and they did not disappoint. They also added a a slight heat that provided that nice slow burn that grows so satisfyingly powerful with every bite that you take. If you don't have fresh poblano peppers you could use them in their dried form, which are ancho peppers. You should be able to find them without too much of a search. If not, any kind of pepper or chili would work. Just use as much or as little as you wish to provide the level of heat with which you are most comfortable. Try these beans for a new twist on an old favorite at your next cook-out. They are the perfect complement for whatever you've thrown on the grill. Preheat the oven to 300 deg. F. Heat oil in a dutch oven over medium-high heat. Add onion and garlic and cook until the onion is just translucent. Add the poblano pepper slices and season with salt and pepper. Cook until the peppers are tender, about 7 more minutes. Add the chili powder and cumin and cook for one minute. Add the beans with their liquid, the tomato puree, water, and oregano and stir to combine. Bring to a boil, cover, and cook on a middle rack in the oven for about 2-1/2 hours until the mixture is nice and thick. Check after the first hour, and then every half hour after that.